After a week at Annecy, I will only say that if you’re an animator or work in animation and have a genuine love for all that it is, or even if you just like talking about it all day, then get a few friends, save up, and make it a point to go to Annecy at least once. 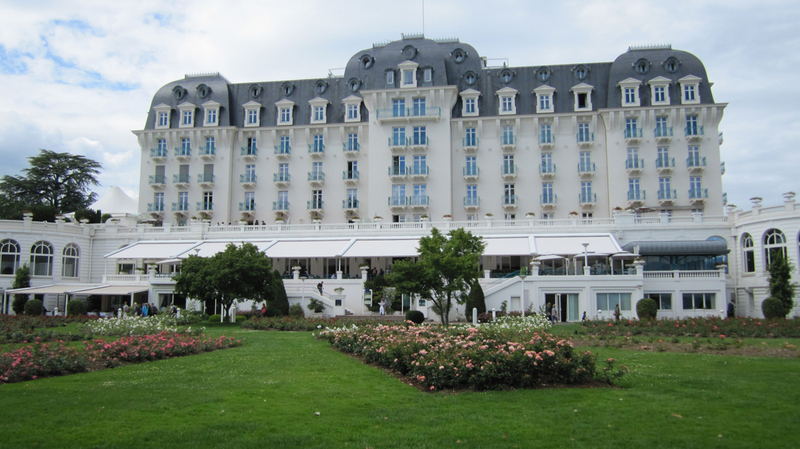 I recognise that I make these observations from the privileged position of being able to actually come to the Annecy festival, and there’s no saying that I will be here next year, for cost reasons among others. It’s expensive, and no doubt anyone in the industry – from the most junior of animators to a seasoned executive who just wishes to see what the fuss is all about – would love to come if time and money afford them to. It’s like a kid who hears and reads about Disneyland all his or her life, but never got a chance to go. And we know there are millions of kids over the world who, sadly, will never experience Disneyland. The memories that I treasure most would probably be the many conversations I had with strangers, new acquaintances and friends and possibly future business partners about life, love and animation (topic of a future post) – not the business of it, or how projects can be financed, or what territories of pre-sales is able to cover how many percent of a production budget etc. (there will be another time and place for all that). Instead we talked about our favourite animated films, love of short films, our favourite scores, sound design, music, our inspirations, and what we hope to do in the near future. The last time I had a similar feeling was at the San Diego Comic Con a few years back. But that was different. Comic Con was mostly a celebration of geek culture, and being at the centre of the show floor was pure, unadulterated joy – like a kid being in a candy store and parents and dentists don’t exist. 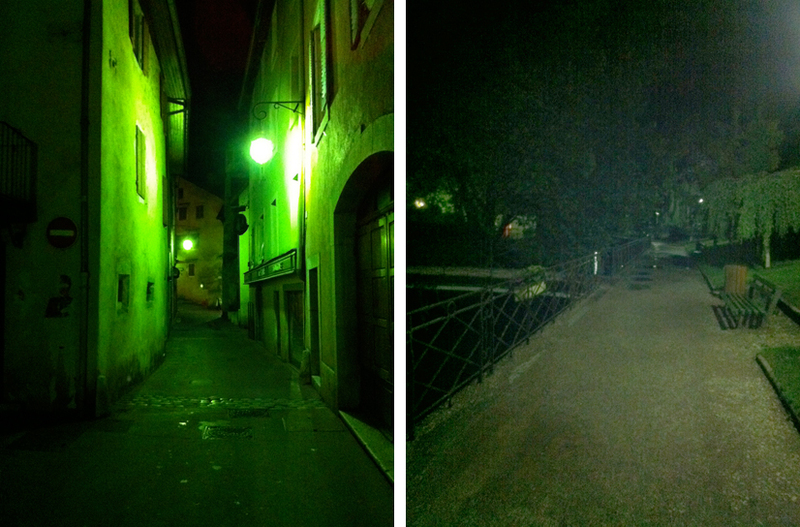 Annecy is different. Here, there is a sense that everyone not only loves animation and storytelling and cool art, but also aspires to achieve something quite specific – whether it’s to make a short film, a feature film, work in a great studio, publish a book, open an art exhibit, or even just be recognised for his or her talent. 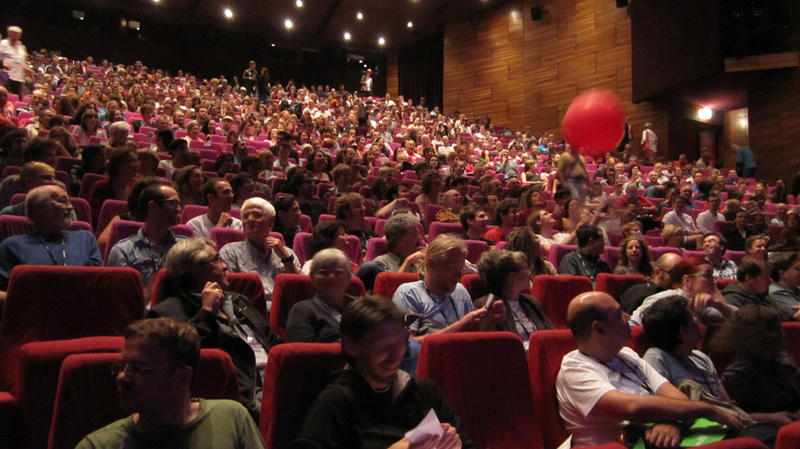 For every filmmaker that went on stage to present his or her film with thunderous applause, hundreds of other aspiring artists and filmmakers are dreaming of his or her moment some day – maybe not on the Annecy stage, but in some other ways, small and big. It’s the same journey we’re all on, and each hopes to find his or her pot of gold at the end of different rainbows. Friday came sooner than I had hoped. 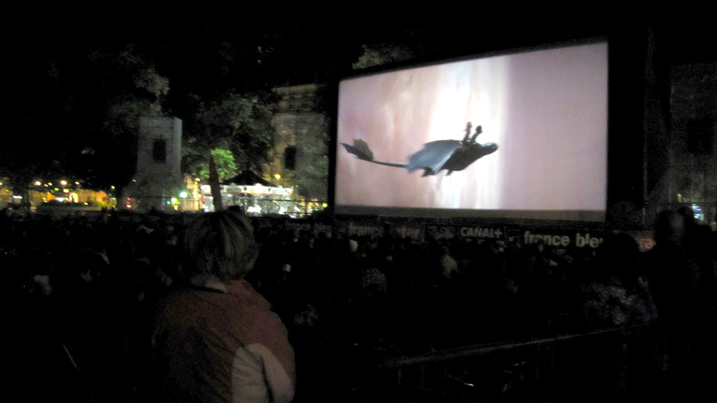 I spent a good part of my final night at the giant outdoor screening. That night’s movie was How To Train Your Dragon – one of my favourites from last year (including John Powell’s powerful score), which also holds bittersweet memories for me. Nevermind that it was in French. 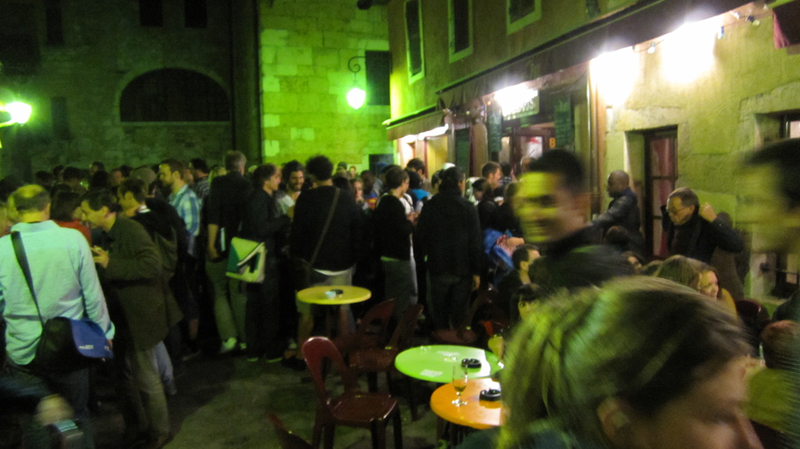 After the movie it was back to Café Des Arts, where the crowd was the biggest I’ve seen yet (a fire hazard, really). But many of the same faces were there, and it wasn’t long when friends new and a few days old were seated around the usual spot again, beer in hands and chatting away. Some even bought their own beer (much cheaper). Nearing 2am and it was time for me to hit that dark, eerie gravel road back to my hotel. My airport shuttle leaves in 4 hours and I had barely packed. And so we said our goodbyes, not exchanging all our names but surely remembering each others’ faces, agreeing to meet at the same pub at next year’s festival. 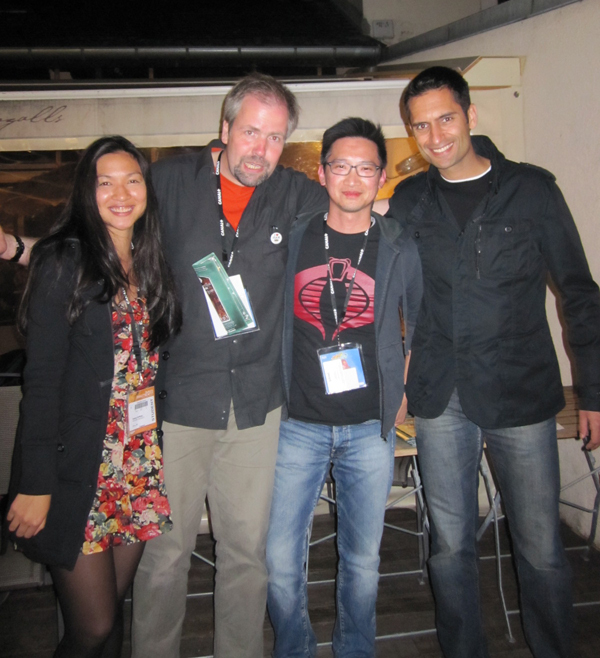 Whether that happens or not is anyone’s guess, but it was a good way for new friends to part, and for me to leave my first Annecy. 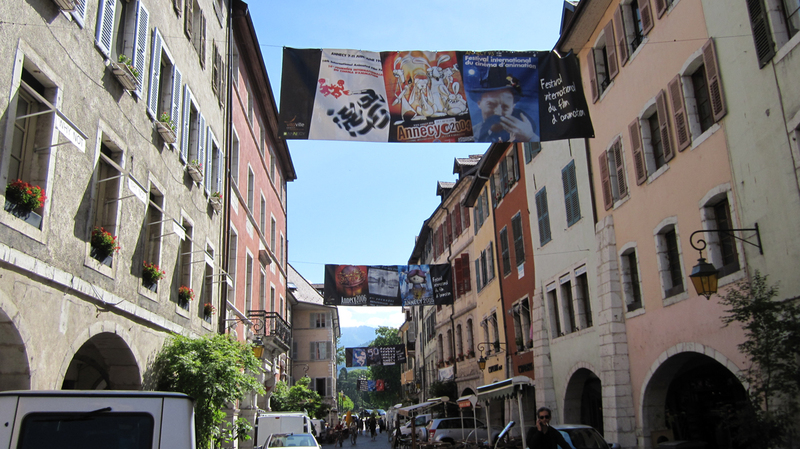 The main reason I was at Annecy was in fact because there’s a business segment – MIFA, which is a mini-market with a strong European focus. My meeting schedule wasn’t actually that packed as I had wanted to make room for some conference sessions. In the end though I swapped those for workshops by Disney Animation Studios. I figured rather than hear a bunch of executives talk about ‘issues and trends’ – which tend to be either repetitive or end up being really more about their own projects (believe me I’ve been to plenty of those), it’d be a better deal to hear Disney artists talk about story art, acting in animation, story reels etc. with real examples as they go through their recent films. How often do we get to see THAT? 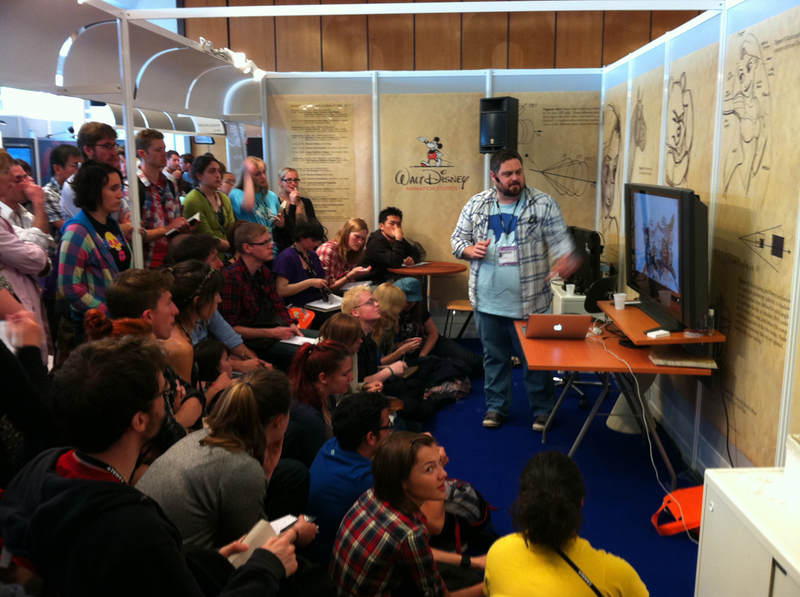 ‘Art of Story’ talk by Disney Animation Studios. There were of course the required business meetings and buyer pitches, and they went well enough, by and large. But I definitely get the feeling that even the suits are at Annecy because it’s a more relaxed environment, and certainly more scenic and personable than the craziness that are the Cannes markets. 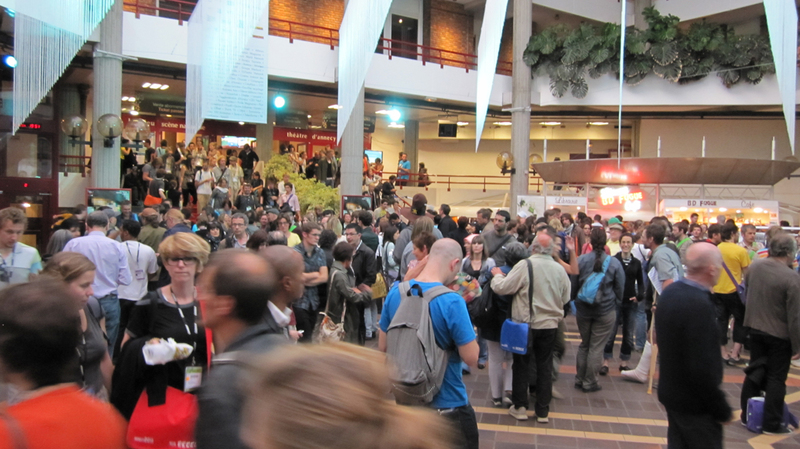 Granted the scale of MIFA is a fraction of MIPTV / MIPCOM, but it is ALL animation and most would agree that when it comes to these meetings, quality time is far better than 30 min back-to-back meetings all day long. 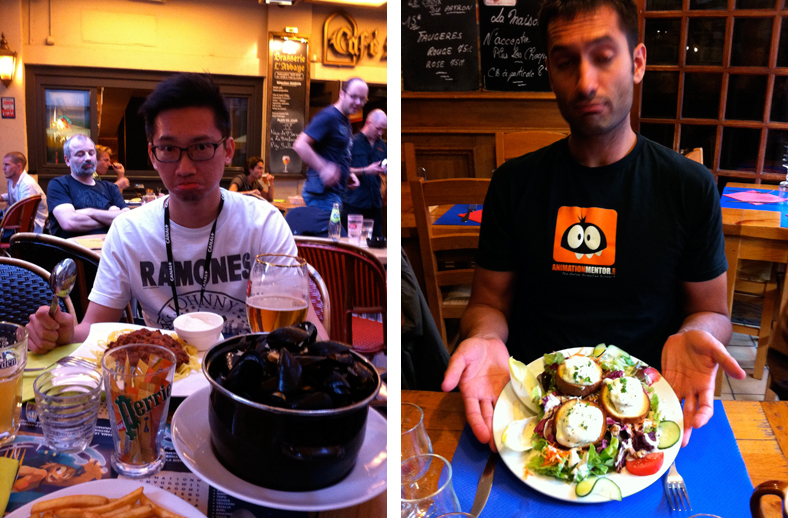 Food in Annecy, for the most part, is decent. 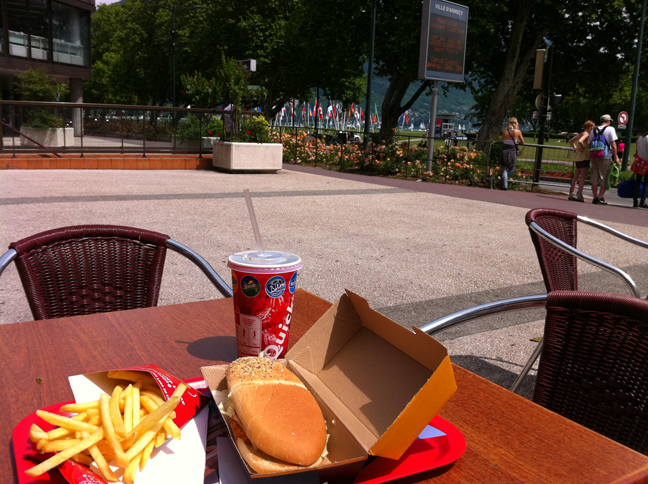 Except for Quick Burger, the only fast food joint in the area, which was horrible (I passed on the mayonaise). Still, it was a life saver between tight screenings. 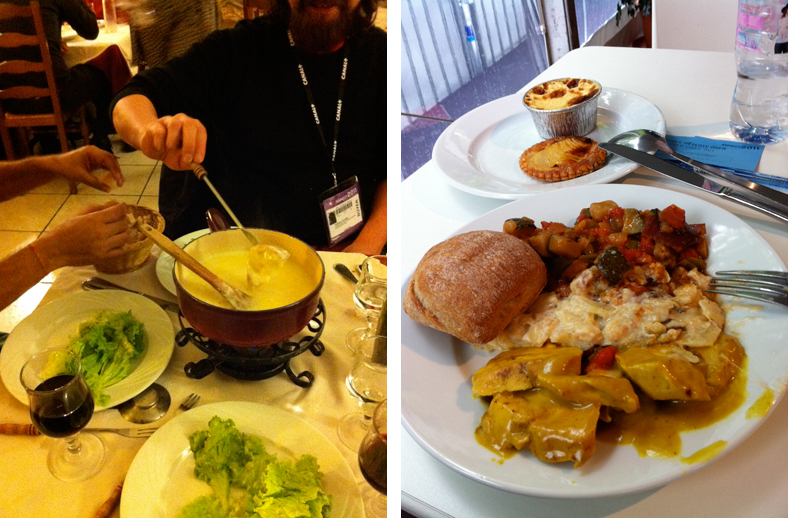 Food prices were lower than those in Cannes (although the quality doesn’t come close). Waiters and waitresses are also friendlier, although they still take ions to appear for an order. As for my daily hotel ‘buffet’ breakfast (by that I mean a borderline respectable assortment of flour-based products), by the 5th day I had developed a vengeful resentment towards croissants. I wanted to make the crossaint eat itself so it knows how bland it tastes, then drowned it in the weak foamy coffee I’ve been drinking for what seemed an eternity. Back to the festival (cos that’s where most of the fun is) – there is a conspicuous absence of Asian short films in the official selection. Why that is the case I don’t really know. I’ve seen plenty of Japanese and Korean shorts over the years that have blown my mind, and even China has some amazing talents coming through. I’ve seen their commercial work and they’re not only great artistically but just in terms of sensibilities they would surely add a richness to a festival full of great films but nonetheless are dominated by European fare. My second favourite Scotsman (after Kenny Dalglish), Ken Anderson, told me he has a friend in the Annecy jury and she told him plainly that the entries from Singapore just did not cut it. I don’t know many filmmakers locally that are doing independent animation work, so it’s likely they’re mostly students’ work. It’s a rather sad state of affairs that many people less in touch with the industry may not care much for – that much, much more need to be done to help develop the craft rather than the business of it all – and it’s definitely an ailment that will exacerbate the chronic lack of strong animation directors as well as writers in Singapore. It’s been a while since I’ve gone somewhere new. While France is not exactly ‘new’ as a destination, the only collective experience I have of the country are horror transits at Charles de Gaulle airport and labourous days on end in Cannes at one of the TV markets. 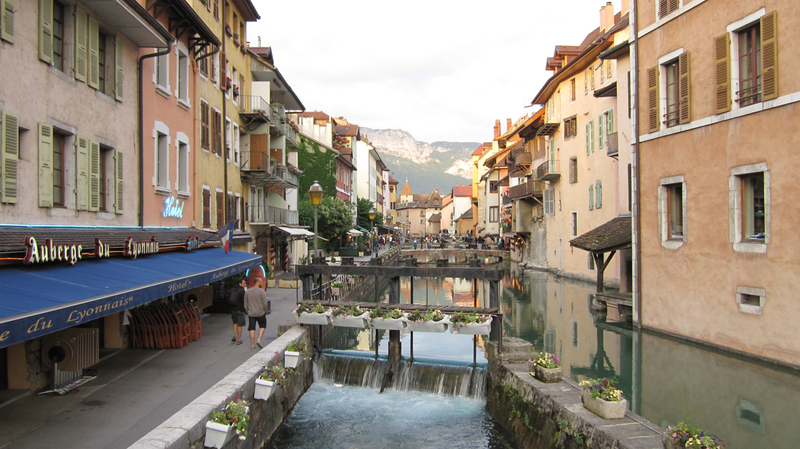 It’s strange then to descend on a little town called Annecy by the southeast of France, 30 minutes from Geneva airport, on a lazy Sunday summer afternoon. 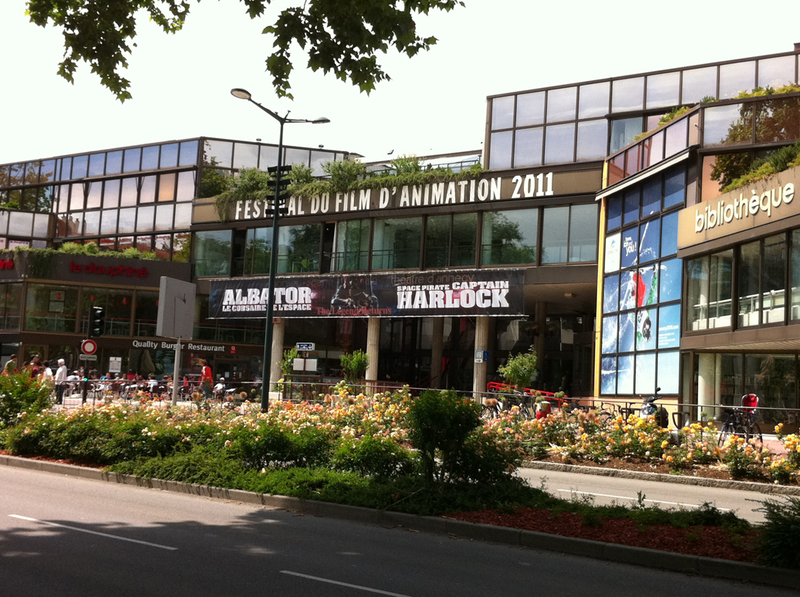 Here’s the venue for the fabled Annecy International Animation Film Festival, now into its 51st year. Festivals, especially one that’s half way round the world, could understandably be perceived as luxury events to attend by animation companies more concerned with looming deadlines then independent, art-house films and general merry-making amongst artists and animators. Truth be told, we are not (and no commercial entity is) in the business of making short films for festivals. Short films don’t make money. And companies need to make money to exist. But I think it comes down to the overarching aspirations of any given studio. Now, this would typically be either to produce great TV shows that sell the world over, or make films that are box office successes, which in turn translate to merchandise from lunchboxes to video games to bed sheets and pyjamas. But there would be studios – and studios are invariably a reflection of their founders and directors’ philosophies and personalities – that aspire to higher levels of personal and creative expression; to not simply tell stories (because there will always be a need for that, whether it’s on TV or film) but tell them well and from the heart, and to ensure that creative enterprise permeates through the the studio, commercial realities notwithstanding. Animation is merely an art form, but it is one with such limitless cinematic possibilities that to be a great animation studio must be to possess the tenacity and commitment to help its artists push those creative boundaries and nurture talents to become great storytellers. 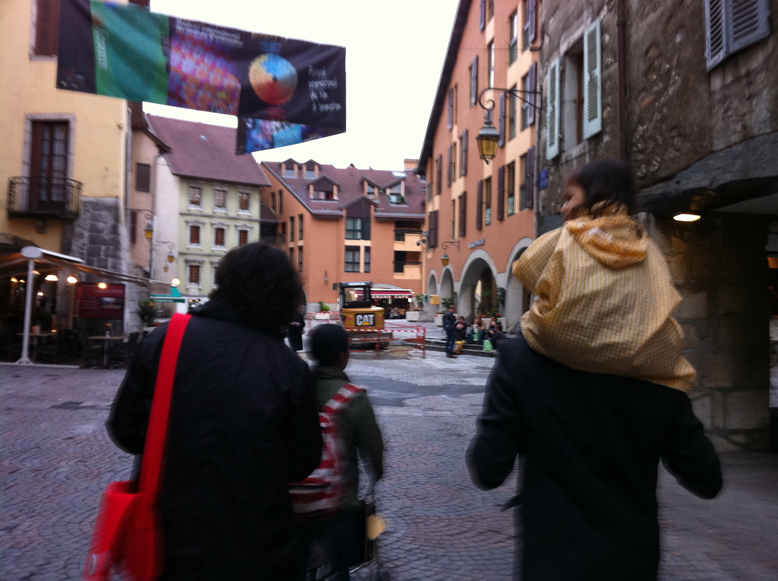 I think that is what Annecy is about. It does not celebrate the commercial success of animation (frankly, there’s no need to), but an art form that is at once infinitely varied yet universal in its language to tell any possible kind of story. And of course, it celebrates the filmmakers. I attended mostly the short films in competition screenings at the main theatre venue Bonlieu, hoping to take in as eclectic an experience as I could. I don’t think one really comes out of these screenings with a definite mood. Some films are deeply personal, some are more commercial. Some are hilarious, and some make you want to put a bullet in your head. Some stir your heart and awakens the soul. Some boggle the mind, and some simply f*** with it. And then there are those that sort of straddle across a few of the above categories. Maybe that’s why the pub is usually the best place to go after a screening. There are several pubs in the area that I was told are the usual drinking holes. There’s the Captain’s Pub, where the brits frequent. There’s the Irish Pub, where…well, the Irish, along with other folksy suit types go to (I was there on Wed with the Cartoon Network and Disney guys and saw someone tried to light his fart outside the pub). Then there’s the American Bar or Scotch Bar where the Americans hang out. I told my friend Alex (who’s from Israel) the town needs an Asian bar. But since the Asian population is so small, he suggested combining Asian and Jews. It could well be the bar with the most gang fights. 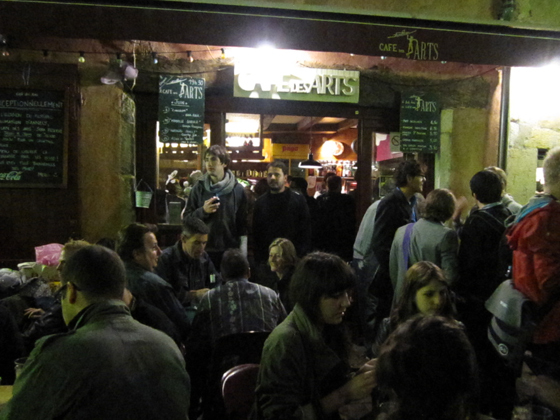 But the place that the animators and creative types frequent above all others must surely be Café Des Arts, a quaint little joint nestled in a cul-de-sac at the end of a little bridge across the canal. It’s packed to the brim on just about every night during the festival. It’s also the one where animators and artists mingle like they all graduated from one big class, draw and doodle on their sketch books half drunk, and talk about the films they saw that day. For an executive like me who’s used to suits who are usually more interested in how much financing we can bring to a project or how cheap our studio can produce something or what shows we could give them to add to their distribution catalogue (and to be fair they’re just doing they’re job), it’s such a refreshing and invigorating feeling to be among young people whose lives, for the most part, revolve plainly around bringing drawings to life on paper (or in a computer), and are so hungry for inspiration and to improve their craft they’d listen to anyone who has something to say about their work or just chat about animation over a few rounds. The only part I didn’t look forward to after drinks was the dark and eerie gravel road I had to take on the way back to the hotel. There’s been cases of mugging during the festival over the last few years I was told and I definitely looked over my shoulders more than once every night as I took the long road. If things got rough I was ready to either run or act like a I’m having a mental meltdown. Jumping into the canal in that temperature wasn’t an option, unfortunately. Back to the short film screenings – being in the theatre is an experience in itself, if somewhat bizarre for the uninitiated. 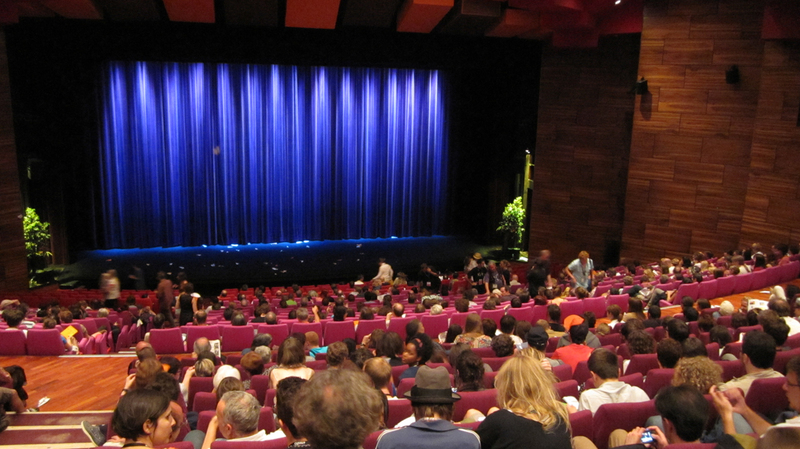 They’re almost always full, and the crowd boisterous before the films commence. There’s the time-honoured ‘competition’ of hurling paper planes at the screen, and every plane that reaches its destination (which is near impossible) always receives a generous round of applause and cheers. This year there was apparently a new quirk – audiences making bubbling noises just as the lights go down which makes the theatre feels like being inside an aquarium with invisible goldfishes. It’s interesting how some of the short films don’t really reflect the mood of the audience, as you would expect in a typical theatre screening. No matter how dark or depressing certain films are (and there were plenty of those), the crowd is always hopelessly jovial – clapping to music, relentless with their paper planes and even singing. One suspects they’re just happy to be there, among their friends and peers, reveling in the whole tribal spirit and just watching animation – which is probably the one thing that defines most of their lives. ; a higher purpose that they live for and a craft that they are striving to perfect. But it’s also just a really, really fun experience. If I – perhaps an unrequited artist disguised as an animation executive who struggles ever so often to reconcile the apparent conflicts between commerce and art, and could in fact have developed a dangerous cynicism that veils my perception of the industry – can emerge from it all with a somewhat renewed vision, then as an animator, you‘re just gonna have the time of your life.